Red Poling took over as CEO from Don Petersen in 1990 and was succeeded by Alex Trotman in 1993. DETROIT -- Harold "Red" Poling, the CEO who helped revive Ford Motor Co. after steering the automaker through the recession of the early 1990s, died on Saturday in Pacific Grove, Calif. He was 86. "Red Poling was an extraordinary leader who had a profound impact on Ford Motor Co. and everyone who worked with him," Executive Chairman Bill Ford said in a statement. "With a list of accomplishments that span 43 years, including leading the company through a remarkable turnaround during the 1980s and 1990s, Red was respected by all for his leadership, his passion for being the low-cost producer and his genuine affinity for people." Poling took over as CEO from Don Petersen in 1990 and was succeeded by Alex Trotman in 1993. Trotman died in 2005. 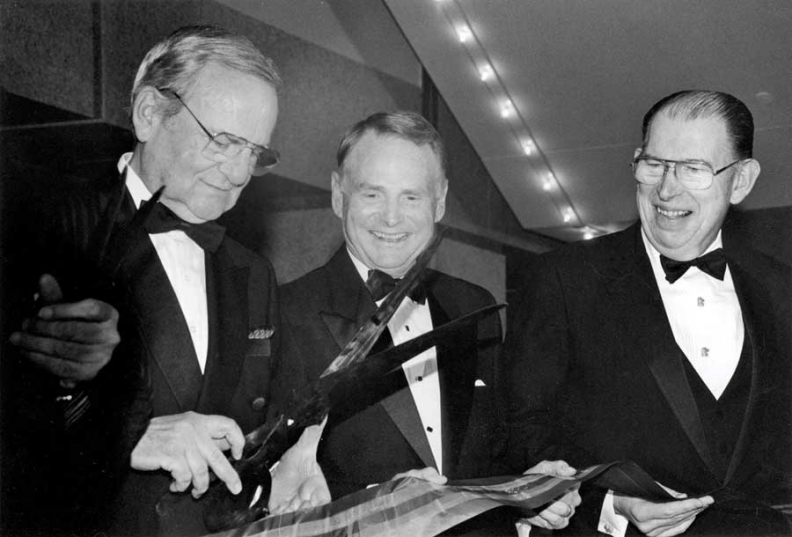 Ford's Red Poling, in an undated photo, flanked by Chrysler's Lee Iacocca and GM's Robert Stempel. Poling made his mark on the company as a rigorous financial leader. His attention to costs allowed Ford to surpass the much larger General Motors in profits in the late 1980s. When Philip Caldwell took over from Henry Ford II as Ford's CEO on Oct. 1, 1979, becoming the first nonfamily member to head the automaker, Poling and Petersen were two of his key lieutenants. In 1986, with Petersen as CEO and Poling as president, Ford's profits topped GM's, $3.3 billion to $2.9 billion, for the first time since 1924. Ford's profit rise continued, hitting a then industry-record $5.3 billion in 1988. Poling, who was chairman and CEO from 1990 to 1994, led the company through a deep recession, when Ford's sales in North America and Europe plunged and losses totaled $9.64 billion in 1991 and 1992. But by the time Poling retired, Ford controlled 25.3 percent of the U.S. auto market, up from 21 percent in 1983, and had net income of $2.53 billion in 1993, his final full year. During another financial crisis in the early 1980s, Poling, as leader of Ford's North American auto operations, approved spending $3 billion to engineer an aerodynamic sedan named Taurus that became the top-selling car in the U.S.
"We bet the company," Poling said in a 1993 corporate biography. "It was a tremendous gamble, but it has paid off handsomely." The automaker introduced the Taurus in 1985 as a 1986 model. Poling joined Ford in 1951 as a cost analyst in the steel division controller's office. He rose through Ford's finance ranks, working at a variety of positions in Europe and North America. His first appearance at a Ford board meeting, he once told a reporter, came when he was asked to run the slide projector during a review of whether Ford should sell its Rouge Steel operations, decades before Ford actually sold the unit. Early in his career, he was mentored by J. Edward Lundy, one of Ford's original Whiz Kids and the automaker's longtime CFO. Poling was known for a fanatical insistence on cost controls. Among those whom he turned into a stickler on costs was Bob Lutz, who joined Ford after stints at GM's Adam Opel AG unit and BMW. According to Lutz, Poling told him: "You know the difference between you and me? If we had a product program that was on track, and it was going to produce a fine car that would be competitive and would meet all its financial targets, and the devil came to you and said, 'Go $5 over the cost targets and I will make sure that this is the best and most successful car of all time,' you'd say yes, and I wouldn't." "You're right," Lutz replied. "I would say yes for $5; hell, I'd say yes for $50." Poling shot back: "To me, financial discipline comes above everything else. It comes above creativity, above product. If you lose financial discipline, you've lost everything." In an incident that became legend within Ford, Poling delivered a sharp rebuke to the team that produced the 1989 Ford Thunderbird. The top-of-the-line SuperCoupe version of the Thunderbird won Motor Trend's Car of the Year award, among other accolades. But Poling wasn't impressed. As recounted in the book Comeback: The Fall and Rise of the American Automobile Industry, by Paul Ingrassia and Joseph B. White, Poling told the team he didn't care about the awards or even that the Thunderbird, code-named MN-12, had been launched on time, unlike the highly acclaimed Taurus. "What he did care about were the targets that the MN-12 team had set for the weight and the cost of the new car. And the team had missed both those targets by a mile," the book reported. 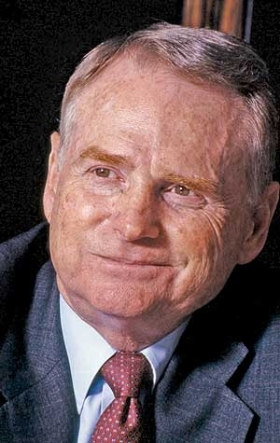 Poling took over as chairman and CEO in 1990, after Petersen ran afoul of Bill Ford Jr. and Edsel Ford II, the next generation of Ford family members on the automaker's board. Poling was 64. The company gave him a special exemption from its mandatory retirement age of 65, allowing him to stay on as chairman until 1994. At a rollout ceremony for the redesigned 1994 Mustang at the sprawling Rouge plant in Dearborn, Mich., on Oct. 4, 1993, Poling handed Trotman the keys to an arrest-me red Mustang -- and, symbolically, to the company. Poling's plaque: What part of 'no' don't you understand?